The first pike I ever caught on a lure was in July 1989, it took a small plug that was at rest on the	surface. What an introduction to the sport! I can remember it very clearly and can go back now and see the exact spot, tight under an alder branch over about 18" of water in a small clear patch among a lot	of weed. It was just one small incident but within that short tale lies a lot of the essence of surface fishing. July, shallow water, weed and bankside cover were all	important factors in that first success. Time of year and (as always) location are the first two things to get right. Pike will take lures from the surface at any time of year but "proper" sport on topwaters is roughly confined to the frost-free period between approximately mid-May	and some time in September. Warmer springs and autumns are extending this period, perhaps in twenty years time we will regularly be using topwaters in March. Location is perhaps more generalised into the places where pike are quite close to the surface, water clarity must be a factor here, but 10ft seems about the maximum that a pike will rise	to hit a surface lure and perhaps half that is usually a more reasonable expectation. I do not simply mean the depth of water but the depth at which the pike is lying in that water. A pike could easily be hiding in the top layers of a 10ft deep weedbed in 14ft of water. Weed is a major factor in finding pike that will take topwaters, because it does provide cover close to the surface that pike will use. Weed that actually grows to the surface, like lilies or potamegaton, obviously cause a few	presentational problems. Some lures are better than others at dealing with weed, and you have to use what you can, even if that lure would not be your first choice, it is better to use a lesser presentation in a place where there are some pike than to use a favoured technique where there are none! So what lures should you use? 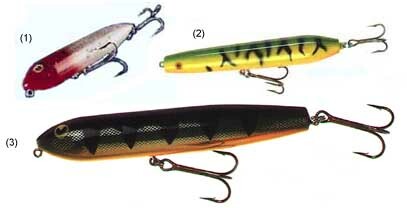 Firstly a look at the "proper" topwater lures that are designed specially for surface use, then a look at other lures that can be used for some surface applications, there is a mixture of sizes, surface lures don't have to be huge. Some of these might have been described elsewhere on these pages. 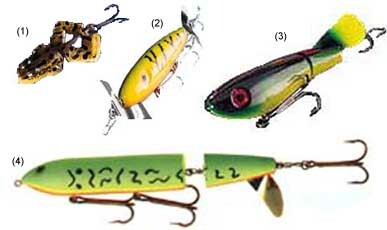 Prop-baits: floating plugs with one or more prop blades mounted at the front, back or even in the middle in different permutations. They all float and on the retrieve the blades churn up the water surface. They create quite a wake, clearly visible from some distance, as well as making a fair racket. I confess to never having done really well with prop baits, a few fish here and there but never a double. It is tempting to retrieve them fairly quickly and steadily to keep the props turning, but they may be more successful if fished stop and start in short bursts. I have done a little better since I wised up to this. There are plenty to choose from in sizes from 2" to 8", with various types and numbers of props. 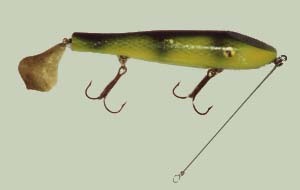 (1)Rebel Buzz'n Frog, 3/8oz, 2" long with the single prop at the rear designed to look like the frog's rear legs. Has one upturned double hook at the tail which should help keep it weedless. (2)Luhr Jensen Ozark Woodchopper, 3/4oz, 4" long with a prop at both ends. The props rotate in opposite directions, this prevents torque from twisting the whole lure on the retrieve. Fitted with 3 VMC trebles, I have used this one successfully. (3)Bucher Top Raider 2oz, 5.1" long with one single-blade tail prop. Very loud, "plopping" rather than "buzzing" sound. (4)Poe's Awaker 2oz, 8" long with one single blade tail prop. The blade needs a bit of bending to get the best out of this bait, and it will need more attention from time to time because fish (hopefully!) will bend it a little. Stick Baits: simple plugs, just a tail-weighted wooden dowel with hooks. There is no lip and and it has no action when cranked, it is a surface jerkbait that has to be worked with the well-known "walk-the-dog" action. This is a simple pull, pause, pull, pause, etc., that sets the lure zig-zagging from side to side across the surface. This is quite simple to learn and sometimes very effective. Stick baits come in sizes from about 4" to 8" and are a very important part of the surface lure armoury. (1)Heddon Zara Spook, 3/8oz, 4.5" long. Sweet action with a light leader. (2)Ace Top Doctor, 2oz, 6.2" long. Both of mine take in water after a short time and actually work just under the surface. (3)Poe's Giant Jackpot, 2.5oz, 7.5" long. First choice for use on jerkbait gear. Crawlers: a broad group encompassing various designs that all try to create the illusion of an animal struggling to swim across the surface. Some of them have "wings" - metal protrusions that stick out on either side and dig into the water alternately to rock the bait from side to side. Some have a combination of features including lips and props so they are composite designs but all have the "crawling" action. (1)Heddon Crazy Crawler, 9/16oz, 2.3" long. Well known as the first crawler widely available in the UK. Used with a lightweight leader this splashes it's way merrily on a steady retrieve, but the leader weight and retrieve speed is critical. I only ever caught small jacks on them. (2)Argobast Original Jitterbug, 5/8oz, 3". Similar pegigree to the Crazy Crawler, quieter action. There are bigger and jointed versions that might be better options for pike. (3)Smity Scuttlebug 1.75oz, 5" long. A metal plate at the nose gives this bait a great side to side action. I have used this one and like it. Long casting and three actions: slow wobble, fast splashy wobble and a jump over obstacles on a fast pull. Long casting and good hooking. Mouldy's Magnum Hawg Wobbler, 3oz, 10" long. A very big mouthful and an utter failure for me. The smaller 6" version is the one to have, highly rated by many. NEW INFO I have now bought, used and caught pike on the Mouldy "Husky" Hawg Wobbler (see Rollie & Helen's catalogue P73). At over 7" long and weighing a couple of ounces this is big enough to cast a good distance and three big trebles help to hook and hold inaccurate pike. Poppers: simple plugs with a dished face that makes a splash and a popping noise when the plug is twitched. For me these are the least useful of the surface lure categories, but they will catch pike, the twitch-stop retrieve is of limited value in running water where the current moves the lure out of position. Sizes from 2.5" up to about 6". I have made a few bigger versions of these that make a fair old "plop" but with no great success, they seem a very minor tactic for pike. similar to spinnerbaits but with propellor blades, designed to be cranked quickly so the lift from the blade keeps the lure on the surface, making a very splashy wake. The speed seems far too fast but I have caught pike on the Severn and Avon with these, much to my surprise. The weight is often somewhat limited by the amount of lift from the blade to between 1/8 and 3/8oz which limits their use to lighter set-ups, but there are one or two heavier versions around now that work on heavy baitcasting tackle. NEW INFO I have now bought, used and caught pike on the Big Game Racket Buzzer (see Rollie and Helen's catalogue). This is heavy enough to be cast on heavy baitcasting gear and it catches pike . I removed the straight twintail trailer and replaced it with a 6" Mogambo grub, the torque from the screwtail gives a little extra lift, the extra weight helps the cast and the extra bulk makes a better target. This will fish over and through some awful weed beds and sometimes raises pike in open water as well, when other topwaters are failing. The speed of the retrieve is almost ludicrous but the pike seem to prefer it going very quickly and churning the surface. Great fun and a real eye-opener to non-lure anglers! Flap-Tails: simple plugs with a single blade hanging from the tail. On some the blade is designed to spin and on others it is designed to rock from side to side, setting up a sympathetic rocking action in the plug. Sizes from 4" to 8". One worry about these is the lack of a treble behind the blade, it sometimes seems that small pike strike at the blade and do not get hooked. Moores Flaptail,1oz, 6" long, rocking tail blade. Must be cranked slowly, very quiet action seems to find takes on hard days. Poes Giant Poetail, 2oz, 8" long, this one has a spinning blade, same body as the Giant Jackpot but with a big blade and one belly treble. I have fond memories of this lure, one day on the Severn at Bevere weir I had caught several pike all around the 8lb mark on various crankbaits, I put my Giant Poetail on, doubting that one treble hook would be adequate, I quickly lost a couple of decent-feeling fish so my first thoughts were confirmed, but at least I'd got takes when the crankbaits had gone quiet. Then after a maximum-length cast a few turns of the reel handle and suddenly the rod is hooped round and the tight clutch is giving line, this one didn't come off and went just over 20lb. I've not done much good with it since, though. Smity SlaptailI've not used this one and I've included it because I have an illustration for it. Many floating diving plugs are buoyant enough to be fished at the surface. Some seem to catch pike fished this way while others do not. The key seems to be the amount of buoyancy and action, if the action is pronounced at a normal diving retrieve speed then there is a chance that there will be some when the plug is retrieved slowly enough to stay on the surface. Two of my favourite plugs for this are the Heddon Meadow Mouse and the Bagley Top Gun, they are very good pike catchers fished this way, but both have their surface action spoiled by a heavy leader. Another is the Manns 1-minus, this will take a heavier leader but tends to run an inch or two under the surface, nearly a topwater and a great catcher. Buoyant alphabet plugs such as a Big 'S' will work, sometimes. Another option, sometimes, is to use a buoyant deep-diving plug and retrieve it v-e-r-y slowly, this requires patience and concentration but every now and then it a very effective technique, this is one of the most likely ways to nail a surface pike in the winter. I have used this on the Severn over shallow water weedbeds when the river is up a little and carrying some colour, I've caught no monsters but it's better than blanking on a hard session. In patchy mixed weed these lipped plugs will sometimes be able to nudge their way through, on a slow, teasing retrieve, with the lip gently pushing strands of weed out of the way of the hooks. Even on these slow almost "actionless" retrieves pike will take the lures, sometimes in preference to a more lively presentation. Again it is better to put any lure where there are some pike than to put the best lure where there are none! This is one of the few situations where I think that rattles really help to draw attention to a plug, I have seen the swirl from a pike a few yards away, taking-off towards the lure before it could see the lure or its ripple pattern and it could only have heard the rattle, takes are often very savage with the pike coming clear out of the water. 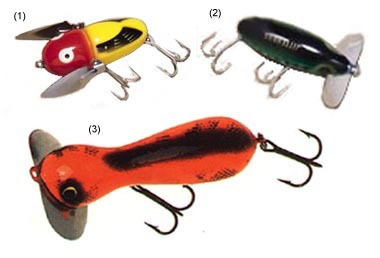 From what I've read over the past couple of years there is a consensus evolving about two key lures, the Mouldy Hawg Wobbler and the Poe's Giant Jackpot. This consensus seems to indicate that these two lures will serve for nearly all surface fishing. I'm not too sure about this but I suspect that fashions will change these preferences anyway. I would agree that a stick bait and a crawler are perhaps the first two lures to get, they cover a lot of the options. Not having used the Hawg Wobbler I can not comment from personal experience but I believe it is fished with a steady retrieve. I have used big stick baits (Poe's Giant Jackpot and the very similar Hi-Fin Skywalker) and they raise a lot of fish, but hook fewer. Seeing fish swirling at surface lures and not hooking them is a regular occurrence, and often frustrating, but do not let it put you off. Once while fishing with Steve Le Maitre, but away to one side I watched his retrieve and saw a swirl about two yards behind his lure, Steve struck, to my surprise and I realised that from his position the swirl appeared to be tight to his lure and he thought it was a take. Maybe the pike had followed the lure and then been frightened by something, either Steve's silhouette or a bird overhead perhaps. But it was not a missed take. A while later we noticed a couple of perch following in the Skywalker and we had an idea, perhaps the pike was striking at perch that were following the plug. Next time he saw a strike behind the Skywalker he cast a Supershad at the swirl and immediately took a nice 6lb pike. I don't suppose it is the complete answer but it is worth bearing in mind. I have heard that the Argobast A.C. plug is a good choice to cast at pike that have shown themselves to other surface lures. It could be that it is generally better to try a simpler presentation to a pike that has shown interest in a lively surface bait. Locating a pike is what we have to do before we can catch one and if a topwater simply finds the pike we should be grateful, even if sometimes we have to use a less exciting method to catch it. Striking at visible "takes" is difficult to resist but when the pike is on then it is on, and you will feel it, exactly as you would with a subsurface bait. Don't strike until you feel the fish. Strikes at nervous pike that are inspecting the lure will only scare them, keep the retrieve working steadily or stop the retrieve completely and pause before restarting. Easier to say than to do! The pause is an important part of all topwater retrieves, sometimes it is as if the pike is hypnotised by the action into following the lure, but it needs a break in that action to trigger a take. You will see a lot of pike when using topwaters and it is tempting to think that they are better at attracting pike than catching them. But think for a moment, if you were fishing a depth you would never know if there were pike coming close to the lure but turning away, and at depth there are less reasons for a pike to spook, they can't see you or other bankside terrors. Remember to use all the bankside cover that is available to minimise the chances of scaring the pike, and perhaps more than with other techniques, be ready for followers coming very close if you stay out of sight. When they do, stop the retrieve and let the lure sit still, watch the pike, if it watches the lure without moving just let it rest, the important thing is not to scare the pike. It is tempting to give the lure a twitch, fair enough, but don't wave the rod about when you do it. If the pike won't take the lure just wait for it to move off before you recast, if you haven't scared it you might still get it, watch out for the follow again, and stop the lure further from the bank, giving you a chance of trying a twitch or two or restarting the retrieve without spooking the pike. Be patient when waiting for the pike to move off, if it is the umpteenth pike you've seen, and you've had a few and it's not very big then it might not matter much about spooking it, but it might be the only pike of the day and scaring it could mean blanking. Another more occasional observation is seeing a pike swirl immediately you begin the retrieve, this is presumably a pike that has come to investigate the splash but is frightened by the sudden start of the retrieve. Try waiting for a few moments after the lure has landed before beginning the retrieve, I have waited up to thirty seconds but perhaps half that is enough. Watch the ripples from the splash, when they have subsided try a twitch or two, then begin the retrieve. Make sure you are ready for the takes. Weather conditions are, of course, critical to success. A good ripple makes pike confident and is likely to have pike moving around in the upper layers of water. A flat calm has the opposite effect, making pike wary and reluctant to come near the surface. Of course we can not always pick and choose the days when we fish so we are likely to be out from time to time when the water is flat calm. What is the best appproach? It is even more important under these conditions not to let the pike see you, use the available cover, maybe I'm a little paranoid about this, but no more than the pike are. Weedbeds are the only place where the pike will be close enough to the surface to be tempted by a topwater so find some weed, the thicker the better and the closer to deeper water the better. These conditions demand quiet techniques; stickbaits, propbaits and noisy crawlers are best if there is some ripple, thought it is tempting to use something that will leave a convincing wake across the calm surface. Look for something with a gentle action, a Meadow Mouse or a Flaptail should be better. In conditions like this the bigger fish will be much harder to find, expect small stuff and scale down lure size a little if possible, to ensure more hook-ups. When you are out on a day with a big ripple go for the big noisy lures and try for bigger fish, they will take topwaters if they are around. At the end of the day as the wind drops towards dusk, again look for quieter lures. Dawn and dusk do seem especially important times for topwaters but there are plenty of occasions when fish can be caught all day. Remember the variety of presentations and learn to use them all, the pike might not have read this so they might follow their own rules. The quiet presentations are more likely to catch on "ripple" days than the noisy ones are on "flat" days but it's always worth a try. I have read that colours cannot make much difference on topwaters since pike only see a silhouette on the surface anyway. This seems reasonable at first glance but it makes one crucial assumption, that the pike is always directly beneath the lure when it sees it, this is obviously nonsense. A pike coming at the lure from the side might first see the lure against a background of bankside vegetation, and different light levels will change just how much colour is visible even in silhouette. Hold a lure up to the sky and look at it yourself, you will be able to see some colour in lower light conditions. But, will the colour make any difference to the pike taking the lure? Make your own mind up. Maybe darker colours make sharper silhouettes and are thus easier targets for the pike. Colour choices on lures are mostly subjective, just cast what you have and don't worry about it too much. There does seem to be a feeling that on any day the pike are either "on" or "off" topwaters, again I can see no difference between topwaters and other lures, somedays you can catch lots of fish and on other days you don't. I have saved many blanks with a suface-caught pike, as long as you take account of the weather and don't scare them, you should be able to get a fish or two most sessions. The only real proviso to this is that some waters seem a lot better than others for topwaters, even when the poor waters appear to have the right characteristics, on the other hand occasionally you find a water that appears wrong but the pike population is very obliging. Try it! Topwater sport is such fun that it does not seem so vital to try for big fish, half a dozen single-figure fish "off the top" will get the adrenalin going and have you gagging to get back to the water. One final point:- topwaters possess powerful magic, on some summer days surface lures are the only presentation that will catch any pike, don't leave home without some.